I have always been fascinated by the story of the Beta Israel Jews of Ethiopia. At the time of the epic Operation Solomon, I was living in Russia. By the time I made aliya, the majority of the Ethiopian Jews were already in Israel. Here in Israel, I met many Ethiopian Jews and my interest in Beta Israel history and traditions became even stronger. This is how one day, while reading a journey diary written in 1910 by the prominent European scholar Jacob Faitlovitch, I read his account of an encounter with a group of Falashas residing in the highlands of North Shewa region of Ethiopia, an area between Gondar, where most Jews lived, and the capital of Ethiopia, Addis Ababa. It took Faitlovitch some time to win the trust of these Falashas, to get any information from them. Finally, they revealed to him that they had come to North Shewa from the Dembiya region near Gondar, mostly at the time of Emperor Menelik II’s rule. In his account, Faitlovitch discussed the difficulties they faced, which pushed them to pretend to be Christians. Faitlovitch expected this group to vanish in two generations, due to assimilation and persecution. More than two generations passed since that time. Fortunately nowadays, access to information is much easier than at the time of Faitlovitch. With the help of the Internet, I contacted a group of Jews in the Kechene neighborhood of the northern part of Addis Ababa, who claim to be descendants of Beta Israel who migrated from Gondar to North Shewa. I went on a long journey, not only a geographically but also in time. The first historical account of Jewish presence in Ethiopia came from a 10th-century Jewish merchant and traveler Eldad Ha-Dani. He recounts that when the Northern Kingdom tribes of Israel went to war against the Southern Kingdom tribe of Judah, the Danites, who were renowned as skilled warriors, refused to fight against their kinsmen and left Israel for Egypt. They continued their journey until they reached the land of Cush where they finally settled. According to their oral history, the Beta Israel of North Shewa settled in Kechene when Menelik II decided to build his new palace in Entoto, north of today’s Addis Ababa. Menelik II needed them for their skills in crafts to build his palaces and produce weapons. For years, the Jews of Kechene continued practicing Judaism in secret, following the instructions of the leaders who still remained in North Shewa. However, recently a group of young people of Kechene have decided to disclose their faith. They have opened a synagogue right in the heart of Kechene, creating serious tensions between the youth and the elders. They call their synagogue Bet Selam, the House of Peace. Thanks to modern technologies, these young Jews have learned about the world Jewish community and modern Jewish practices. In their synagogue, they combine pre-Talmudic practices of their forefathers that trace back to the times of the First Temple and modern rabbinical Jewish practices which they have learned about from the Internet and from visitors. Kechene is the neighborhood of craftsmen, Bal Ej in Amharic. Men mainly work as weavers and blacksmiths and the women work as potters. Similar to the Beta Israel community in Gondar, Bal Ej are slandered as buda, or evil eyed. Their neighbors believe that they are humans at day and hyenas by night. They believe that eye contact with Bal Ej can bring illness or even death. Suspicions remain even among those who are educated, like civil servants and university professors. They avoid approaching Kechene attach a clove of garlic to their arm to protect them from the evil eye if they have to visit the neighborhood. Even though Bal Ej provide Addis Ababa and surrounding areas with clothes, utensils and blacksmith products, they cannot sell their products on their own at markets. Instead, they are forced to sell their items through Christian merchants, which causes them to lose as much as 80 percent of the product price. However the difficulties that people of Kechene are going through, cannot be compared to those experienced by craftsmen from the community who still live in towns and villages of North Shewa. I visited Morat, a small town of North Shewa, where the Beta Israel community first settled when they migrated from Gondar. Most of them are blacksmiths and potters. Almost every month, a member of the community is murdered or has property is destroyed since the Christian neighbors believe each time a person gets sick or dies, it is because of the curse of the “hyena people.” They randomly choose a victim to avenge. Most of the crimes committed against Bal Ej of North Shewa remain unpunished. The police allows murderers to escape or simply fail to investigate the crimes. Life in this town is a life of fear since nobody knows who will be the next victim. To reduce the danger to some degree, community members pretend to be Christians. They go to church on Sunday, but attend hidden synagogues on Saturday. When I interviewed the community members, we had to change topic whenever a stranger entered the room. To protect their secret, I pretended to be an American visitor, since the word Israel itself can raise eyebrows. The biggest challenge was garnering a visit to the synagogues. The locations kept under strict secrecy and visitors are not welcome. It took a long time to build the trust and confidence of elders in order to gain permission to visit a few. The synagogues are located deep in the mountains and getting there requires a long, tiring and sometimes dangerous trek. This strategy of building synagogues in remote and inaccessible places has protected the community for centuries. The compound does not contain Jewish symbols. This is for two reasons. The first is to stave off unwelcome attention from hostile neighbors. The second is that most modern Jewish symbols, such as the Star of David, are simply unknown to the members of the community. There are two entrances to the synagogue, one for men and another for women. Most of the prayers are conducted in Ge’ez, the liturgical language of Beta Israel. 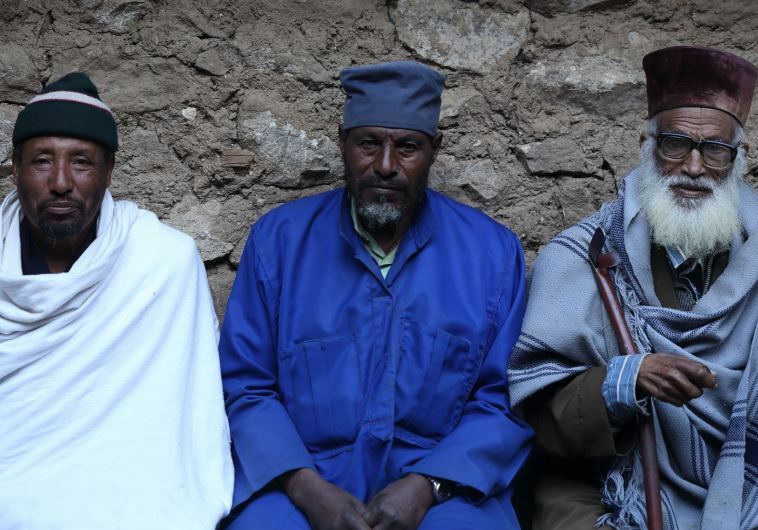 Surprisingly, the spoken language of many community elders is Quarenya, a language of an area near Dembiya. Another interesting feature of the synagogues is that they are always located near a river because the Jews of North Shewa strictly observe the Biblical laws of ritual purity, or niddah. To observe the laws of niddah, a menstruating woman stays in a separate house for seven days. After the seven days she immerses in the river and can then join the rest of the community. The members of the secret synagogues practice pre-Talmudic Judaism, and therefore practice of animal sacrifice for Passover and other occasions. I had a chance to witness the process of sheep slaughter, which corresponds to the laws of Kashrut. It was reminiscent of the traditions of other ancient Jewish communities, such as Bukharian Jews of Central Asia. Even though the community has strong historical evidence of their connection to the Beta Israel of Gondar as well as a remarkable resemblance to their traditions, the community remains unknown to the most of the Jewish world. The chances of the Beta Israel of North Shewa gaining recognition from the Israeli government seems slim. Currently, 6,000 Falash Mura are still waiting to emigrate to Israel, some for 10 to 20 years at the compound near the Israeli embassy in Addis Ababa. To generate awareness of this amazing community, I decided to make a documentary about this community – their culture, traditions, music and struggle to survive and preserve their identity. The film is called Bal Ej: The hidden Jews of Ethiopia and it is due to be released at the beginning of 2016. The Beta Israel of North Shewa are as important to us as we are to them. It is now our turn and obligation to bring the remaining Jews of Ethiopia back to Israel and ensure that both their lives and traditions from Ethiopia are not endangered.